In this episode, rescuing Ewan proves to be the key to weakening AxeKnightmon for good! Which allows Bagramon to take over again and pick up right where he left off. In the end, it's always going to be Bagramon. We will always admire AxeKnightmon for using manipulation, innovation and one outright backstab to claim power. The problem with that method, of course, is that it doesn't take much to topple everything. 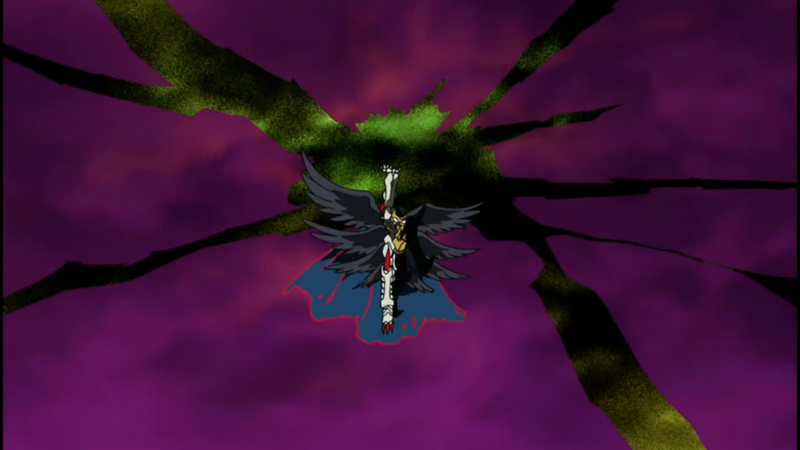 Losing Ewan costs him the power to force digifuse, which costs him the upper hand, which causes Bagramon to overpower him from within, absorb him, and take control. It's shocking how quickly it all unravels for him. It's even more shocking that it doesn't help the good guys one lick. What's surprising is how easy it is for Mikey to dislodge the cog powering AxeKnightmon. Beastmon's primal destruction of Tyutyumon was one of the more satisfying battles this season (how quickly did Tyutyumon go from being barely regarded to outright despised?). It was also played entirely for laughs. From there it was easy to free Ewan and destroy the power plant, completely undoing a season's worth of plotting that brought AxeKnightmon to this point. 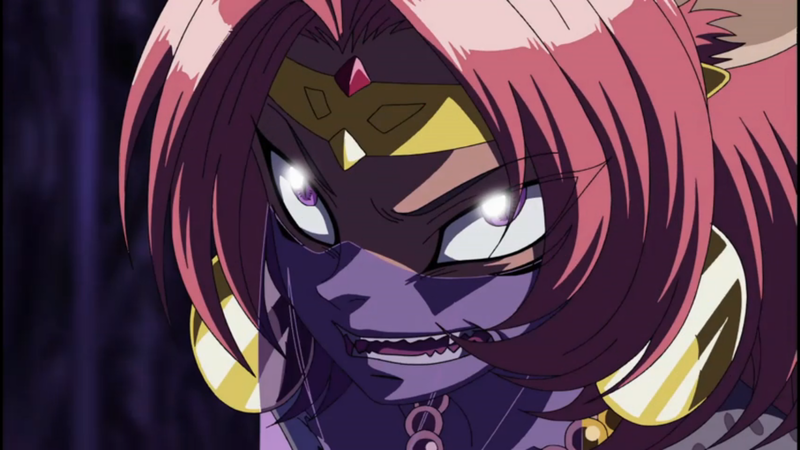 Pretty big upset that the most visible villain over the entire series goes down due to the natural instincts of a tertiary Digimon that barely appears. Not that Ewan's rescue isn't interesting. While he's grateful that Mikey's alive, Ewan is still messed up over all the other deaths he's responsible for. He even lashes out at Mikey, envious of his confidence and seemingly effortless ability to do the right thing. It's an odd thing to resent, but it makes sense in his position. Here's a kid who got so frustrated with reality that he left it for what he thought was freedom, but only led him to do terrible things. He sees Mikey, constantly fighting for the good guys no matter which reality he's in, and with even greater success. Of course he's going to wish that had been his fate instead, even if his confidence is so shot that he doubts he would make it work. Either way, the loss of Ewan paves the way for Bagramon, who makes a distinction between himself and AxeKnightmon that frames his conquest in a more admirable light. While it's hard not to still be more impressed with AxeKnightmon's underdog story, Bagramon observes how their motives differ. Bagramon has a vision- a horrible vision that involves reformatting humanity and folding the human world into a vast dark Digital World, but a vision nonetheless. AxeKnightmon is solely out to best his brother, which in a world often driven by who wants it more, just isn't enough. In this regard, Bagramon has more respect for Shoutmon. While their visions are completely opposite, the fact that he has one is what makes him worthy of the throne. Nobody's going to argue that Shoutmon wants it the most. They figure out that getting the corrupted code crown out of Bagramon is the key to beating him... there's just no easy way to do that. Overpowering him isn't going to happen, as evidenced by X7's quick defeat. It's a combination of pure resolve and strategic desperation that leads Shoutmon to be absorbed. It has to be hard enough for him to even stand up after the abuse he's taking. To do so repeatedly, tearing down Bagramon with his words until the big guy absorbs him is not only the kind of bold courage we're used to out of him, it's a moment that shows us what kind of king he'd make. In the end, D5 is activated, the Fusion Fighters banished to limbo and rescued only by the intervention of some benevolent forces acting through Jeremy and Angie. It's a random way to end things, and endless flashback scenes and the overly wordy explanation of AxeKnightmon's downfall hold the episode back from reaching an emotional high. But it sets itself up for a big finale, and that might be the most important thing the episode can do. So this is now the third “Darkness Before Dawn” variant we've had, with the differences in Zero Two and Frontier only being the placement/inclusion of “the.” There's also a “Darkest Before Duskmon” in Frontier. The season that also doubled up an episode title from Tamers. Boy, AxeKnightmon turning on his brother sure riled Nene up, didn't it? Anyone who watches enough anime will get as much joy out of hearing Laura Bailey go wild as seeing Beastmon. I'm still not buying that Bagramon totally expected AxeKnightmon to turn on him. 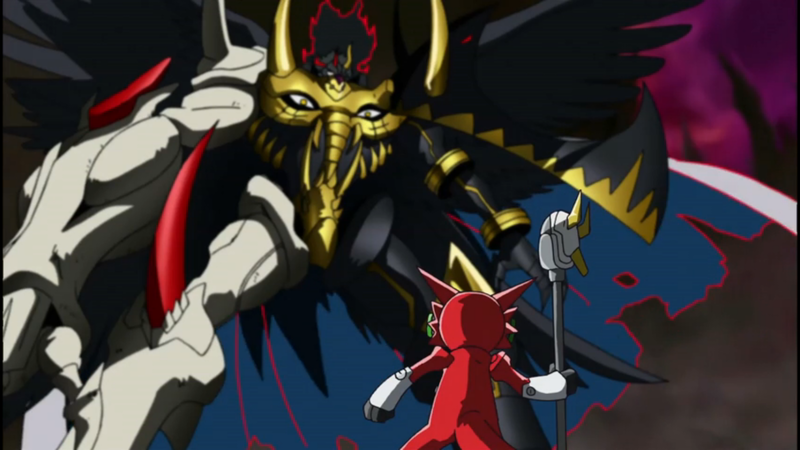 That would have meant he assumed that something would have happened to weaken AxeKnightmon and let him take over again. If he did expect it, he didn't really prepare for it. Suddenly, they're the digi memory cards now. Not that they've been used at all since Dragon Land, but “digicard” and “digimemory” have seemingly merged into one. Also, did MetalGarurumon call in sick and needed Examon as a late fill-in?